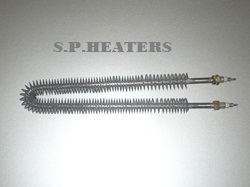 Prominent & Leading Exporter from Chennai, we offer finned strip heater, finned heater and fin heating element. For reasons of quality maintenance, the offered range of Strip Heaters, is manufactured in compliance with the industry set standards, its reasonable pricing and availability in several specifications, gives the product superior preference in the market. In addition, manufactured using the finest raw materials, the product has a superior performance and a commendable functional life. Being a quality centric organization, our company offers a high quality Finned Heater to our clients. With the application of forced air heating, dying apparatus, air ducts and uniform heat transfer, these are offered in 8.2mm to 8.5mm, 11mm to 11.2mm diameters. These are manufactured using chrome nickel steel tube 304, 316 grade, which is procured from certified and reliable vendors. We are manufacture as per the customers requirement also. 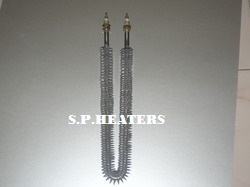 Looking for Finned heaters ?